I was very honoured to be selected by House & Home magazine as a Canadian "A List" Interior Designer for their 30th Anniversary Issue. All my homes and numerous projects have been featured over the years and the thrill of opening up the magazine to see my work never wanes. We were feted at a special brunch at the Royal York on Friday December 09, 2016 hosted by Lynda Reeves and the newly appointed editor-in-chief, Beth Hitchcock. 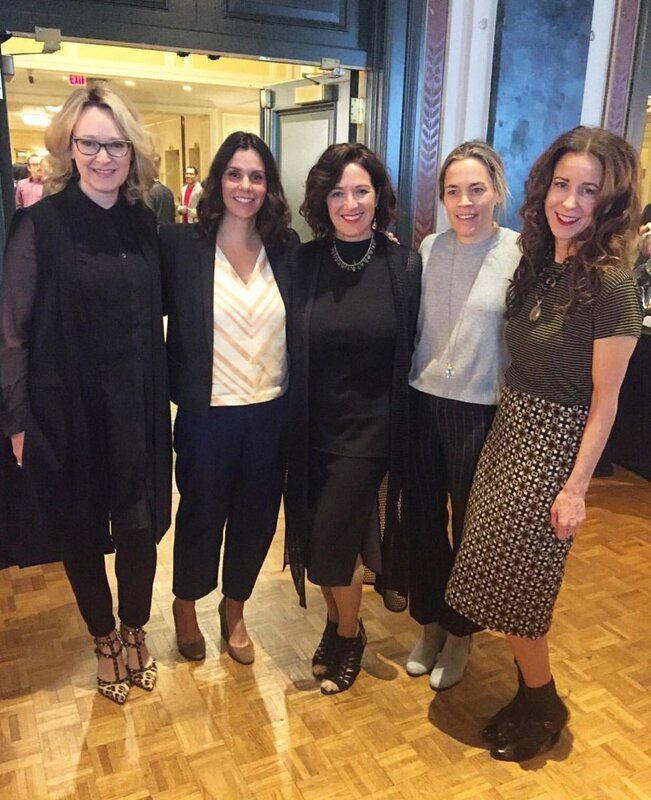 Congratulatory breakfast held at the Royal York Hotel for A-List Interior Designers. From left to right: PR guru Christine Faulhaber, House & Home editor Morgan Michener, fellow honouree Karen Cole, House & Home editor Sally Armstrong and myself. Waterworks Launched "The Perfect Bath"publication and included one of my projects. Waterworks Plumbing Fixtures is truly one of my favourite manufacturers for their high quality and their very stylish take on everything bathroom and kitchen. I am therefore thrilled to be included in owner Barbara Sellick's new book called “The Perfect Bath”. My project (included on Page 245 top right) is from my home. My house was built in the 1930’s and my design concept was inspired by that rich era taking as my inspiration the life of Coco Chanel. I imagined that this is what her ensuite would be like in her apartment in the Paris Ritz. It features a chic combination of black marble & glass and hand finished cherry wood combined with a warm, smokey brown accent to create drama and warmth. From left: Theresa Casey,Toronto, Christopher Kennedy, Palm Springs, Patty Domingez, VP Consentino, Drew McGuckin, New York, Denise McGaha, Dallas, Cheryl Kees Clendenon, Pensacola, SteffanyHolligngsworth, Santa Fe at the Cosentino Factory in Southern Spain. I met the Spanish Cosentino family on my first trip to their marble quarry and factory in south of Spain 2 years ago. Shortly after I was asked to be the first Canadian Cosentino "Trendspotter" and it has has been an extraordinary collaboration with 5 top American architects and designers. We have travelled together to Spain and New York, and just this past January to Las Vegas for the industry heavyweight show KBIS (Kitchen Bath Industry Showcase), where we launched the results of our collaboration - The Etchings Series. At KBIS headlined the main stage and had a Q & A with Hearst Magazine editor (Elle Decor, House Beautiful, Veranda) Carisha Swanson. The Etchings Series, shown above in black, was inspired by the mosaics of Spain, and is a combination of recycled quartz and marble powders with a reference to terrazzo. I hosted the Canadian launch in June in Toronto. My client's beloved 1850's stone farm house in Milton burnt to the ground in the summer of 2015. I was hired to work on the restoration of the stone portion of the home, and to design an addition for their large family as well as create an area for musical concerts. My concept was to maintain the integrity of the stone portion of the home but connect it to a new contemporary addition for the family quarters. The new concert area was planned to be in the previous two-storey stone farmhouse, doing double service as the formal living room. The space would be completely opened up to create a grand dramatic "Great Room" to house the client's two grand pianos and concert recording equipment. The burnt out shell of the family country home near Milton. The interior after the fire. Construction of the new contemporary addition. The restored stone walls, the two-storey concert space and the new structure for the roof. Looking ahead to 2017, I will be featured in House and Home's March 2017 issue in a designer feature. As well, I will be collaborating with Cosentino, Kohler Plumbing and Benjamin Moore Paints to design and build a dream kitchen which will be featured in a future publication.